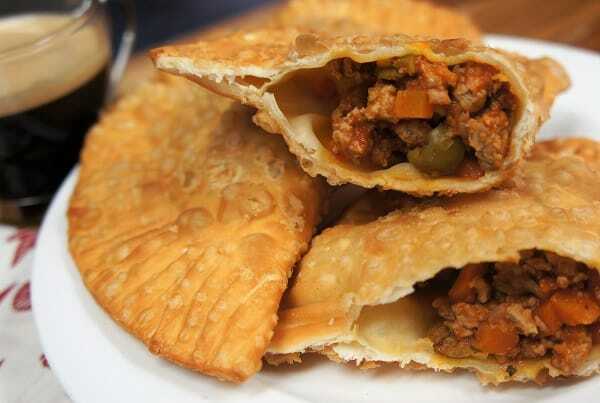 Empanadas are stuffed pastries that are baked or fried. 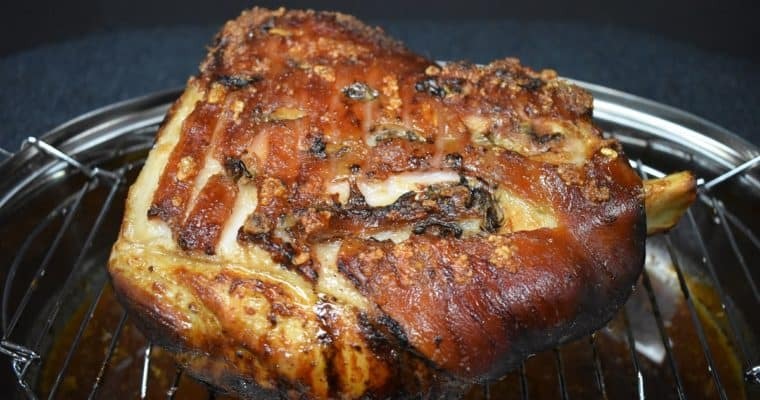 They’re usually stuffed with savory minced meat like chicken, beef or chorizo. In this recipe I replace ground beef with ground turkey and make a (mostly) traditional Cuban picadillo. Then the empanadas are fried until golden. 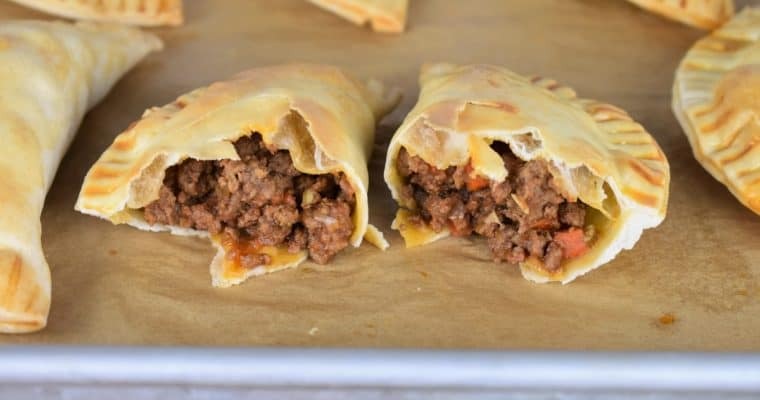 The result is a delicious flaky crust and savory meat filling. Delicioso! Heat the olive oil in a large, deep skillet over medium heat. Add the onions, carrots and celery. Cook about 5-6 minutes until the onions are translucent, stirring frequently. Add the garlic and cook 1 minute, stirring frequently. Raise the heat to high, add the ground turkey, salt, pepper, cumin and oregano to the skillet. Stir to combine the ingredients well, breaking up any large pieces with a wooden spoon or a spatula as you go. Cook 5 minutes to brown the turkey, stirring frequently. Add the wine to the skillet; cook about 2 minutes until most of the liquid evaporates, stirring frequently. Add the tomato sauce, 2 tbsp. water and olives, stir to combine. Lower the heat to medium-low, cover and cook for approximately 20 minutes to allow the flavors to develop and combine, stirring occasionally. Note: Keep the picadillo at a simmer, if the sauce is boiling too vigorously, lower the heat just a bit. Take the picadillo off the heat and allow it to cool completely. Line a couple of baking sheets with parchment paper to place the empanadas. You can stack the empanadas, just use a piece of parchment paper in between so they don’t stick and break. Prepare a small bowl with the beaten egg. Working with one empanada disk at a time, add about 2 heaping tablespoons of the picadillo in the middle. Using a small pastry brush, or your finger, moisten around the edges of the dough. Fold the round in half, press the edges together gently. Use a fork to press the edges together. Set the empanada on the lined baking sheet and repeat with the rest of the ingredients. Add enough oil to a large, deep skillet to cover the bottom by an inch or two. Heat the oil over medium-high heat. Add one or two empanadas at a time. Don’t overcrowd the pan and make sure they don’t touch. Fry the empanadas in the medium-hot oil until golden brown, turning a few times to get a nice even color on both sides. 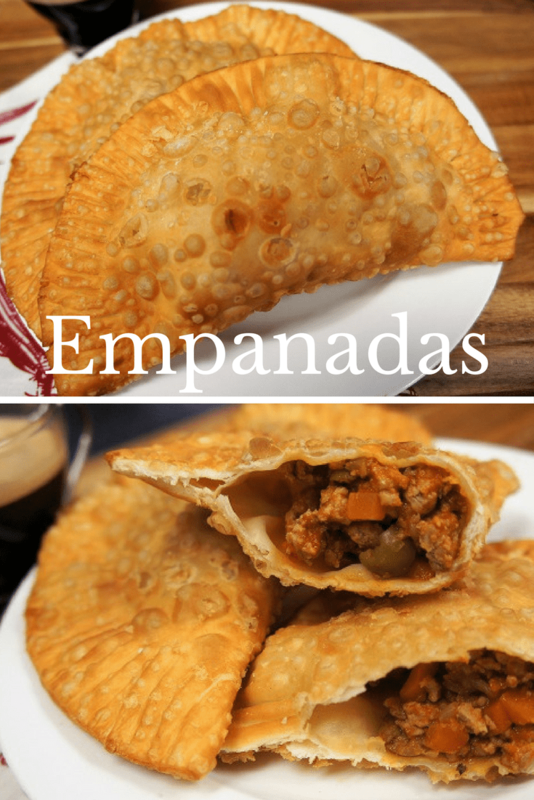 Depending on where you live you may be able to find empanada discs in the freezer section of larger food chains or Latin markets. They’re round, thin dough discs that come frozen, usually ten to a pack. Defrost the discs according to package directions prior to using.